This evergreen conifer grows into a pyramidal form before broadening with age. The needle-like foliage is golden yellow throughout spring and summer, before turning a yellowish green for autumn and winter and makes a brilliant screen that brightens up a dark area. The branches are almost horizontal with elegant weeping tips. Planted in well-drained soil in sun or part shade, this tree will grow to 4 x 3 metres in 20 years. The Golden Deodar Cedar is tolerant of clay and should be planted out of very cold winds. 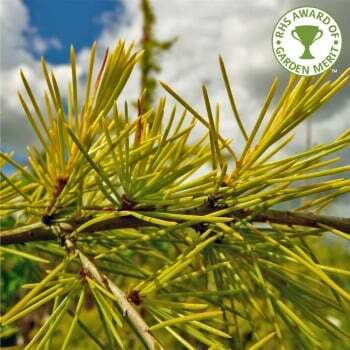 A lovely conifer tree for screening and to use as a feature in the garden, this Golden Cedar variety has received the RHS Award of Garden Merit. A green (with a hint of blue) coloured alternative is Cedrus deodara. When planting Cedar trees, such as Cedrus Deodara Aurea, it is important to prepare the planting area well. Pot grown trees can be planted at any time of the year. Golden Cedar trees do not require a lot of pruning. Simply remove any dead, diseased or awkwardly placed branches from your Cedrus Deodara Aurea tree as and when you see them.